Our second film at the Mill Valley Film Festival was coincidentally another one featuring Geoffrey Rush, and it was almost as good as the first. 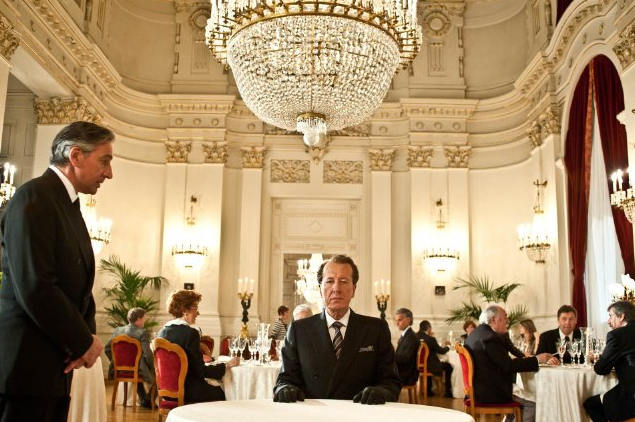 The Best Offer is the first English-language film by writer/director Giuseppe Tornatore. Geoffrey Rush is magnificent as an art auctioneer with OCD. The marvelous and intricate screenplay only works if Rush can make us and the other characters totally believe his character’s peculiarities, and he does so brilliantly. Had he not been so convincing, the entire film would have fallen flat. So what kind of film is it? Unusual and unique, to be sure. Tornatore is clearly influenced by Hitchcock, but with a twist of the British TV series, The Prisoner. Karen Davis, who reviewed the film for the festival also referred to David Lynch, and I can see what she means. It’s at once a romance and a psychological thriller. That description won’t make any sense until you see the film, and I hope you will. Donald Sutherland is the only other actor known to American audiences. He’s not very good in this, but luckily his role is a small one. Cinematographer Fabio Zamarion also draws from Hitchcock’s use of closeups and is unafraid to utilize unusual camera angles and bold compositions, even though the audience is well aware of what he’s doing. The sound editing and mixing are also very good and are important to the plot. But most of all it’s the screenplay, direction and Geoffrey Rush that make this film shine. It’s worth going out of your way to see it if you can. The Best Offer swept this year’s Italian Oscars (David di Donatello Awards).